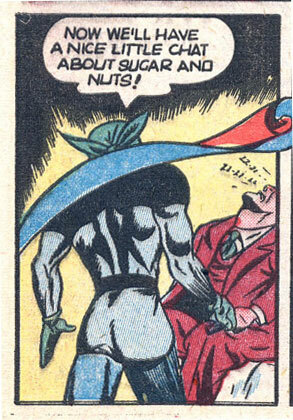 “… and tight spandex butts?” DAmn, I wish the blue in his outfit was green. Great moments in bad homosexual pick-up lines! I hate to rain on everyone else’s parade but I think this is the green mask himself and not a villain. Uh, this guy looks like he’s asleep, so you’re not going to be discussing anything. In fact, the way you say it, it looks like you’re planning to…OH DEAR GOD!!! @Myro: That’s what I was thinking. Forget tights’ you don’t want to hear this from a guy in thigh-high boots.